Mountain cottage in the picturesque village Mala Upa offers 34 beds in 10 rooms with bathroom and WC. 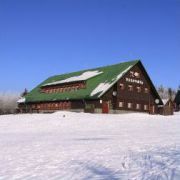 There is … More » a restaurant with bar and panoramic terrace (mountain Sněžka, valley with Church of St.Peter and Paul). Downhill and cross-country trails directly by the cottage. Mountain biking, hiking. Mountain cottage is situated in the historical centre of village Mala Upa in the ski resort, rooms with toilet … More » and shower, dinning room with view at Snezka, bar, sauna, solarium, whirlpool, winter garden, fire place, pool, rent of skies and snowboards, playgrounds, winter-transportation by snow cat. 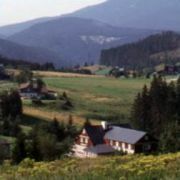 The database contains direct contacts to owners of accommodation in Dolní Malá Úpa. Reservations are passed without any middleman and commission!